The reverse mortgage industry is fully aware of the operational difficulties that extend from regulatory changes and reduced overall volume, but many in the industry also find themselves optimistic about the new kinds of opportunities there are in the current landscape of the business. This and more became clear over the course of a webinar on the topic of current reverse mortgage business realities, hosted Wednesday by RMD. Mayer also said that the new appraisal requirement has been a challenge for some in the industry, while other panelists also pegged industry difficulties on higher closing costs, rising rates, and increased difficulties in qualifying borrowers through financial assessment. One element that could help mitigate these problems in the future, however, is a better and more complete understanding of the customer. One other emerging trend is that financial advisors seem to be warming to the recommendation of a reverse mortgage as a viable option for their clients to manage risks to their retirement assets. Still, getting the word out to potential large-draw borrowers about an overall reduction in costs for taking out a reverse mortgage has not been adequately communicated, Giordano says. 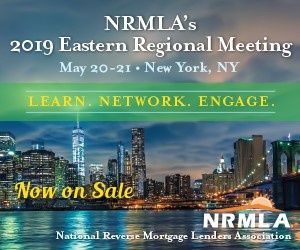 One evolving aspect that seems to excite all the participating panelists is a shift in businesses offering both forward, traditional mortgages along with reverse products, as well as the increasing prevalence of proprietary jumbo products that aren’t tied to the shifting priorities at government regulatory agencies. A lot of time and energy is also being spent in optimizing the ways that customers can interact with the companies offering reverse mortgage products, which can serve to be a major differentiator between more and less successful originators. Others look to successfully integrating into a customer’s retirement plan as paramount to their overall success, providing an opportunity for borrowers to easily integrate access to home equity into their portfolios in order to mitigate risks to their portfolio that could arise from market instability or the rise of an unexpected cost. “We’re looking at successfully funding a thirty year retirement, so we have to manage anything that’s going to put that plan at risk,” said Resch. He told a story of a client who has a home less than ten years old, but was hit with a roof repair costing $30,000 due to poor workmanship, requiring a serious conversation about what to do in order to best preserve the prospects for a full retirement duration. The growing availability of well-researched information from retirement planning thought leaders also helps present a compelling case to potential borrowers and financial planners about the benefits that can be gained by taking a reverse mortgage, and using it strategically in an overall retirement plan. “I think it’s been really helpful over the last few years to be able to turn to actual retirement income experts,” said Giordano. With a major issue identified by Dr. Pfau and other professionals being fixed expenses in retirement, minimizing those expenses as market volatility and the rise of other unexpected costs increases as someone gets older makes the reverse mortgage an attractive option, particularly if someone is able to make regular payments on it. If their other investments begin underperforming, then a borrower can stop making payments and draw from a line of credit until the market improves again. “That’s advice not coming from anyone in the reverse mortgage industry, but it’s coming from real experts in the field,” Giordano said.